Subject: Congratulations on your submission to TUFF! I am very pleased to inform you that your film ‘Crumbruler’ was selected to be part of the Toronto Urban Film Festival, running from September 10-19, 2010. It was chosen by Min Sook Lee for the ‘Urban Ideas and Politics‘ program, and will screen as part of a 10-film program (one film every ten minutes) on September 13th. 80 films were selected this year, out of a total of 355 submissions from 25 countries. Each film submitted was reviewed by one of our seven guest jurors / programmers. 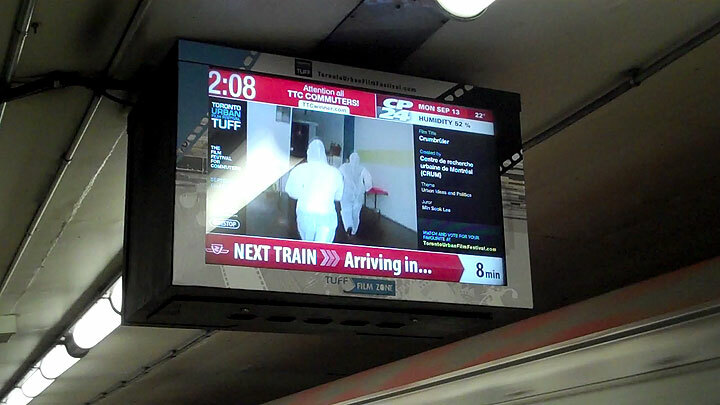 TUFF is seen by an audience of over 1.3 million daily commuters on the subway platforms of Toronto’s transit system. Your film will cycle throughout the day with the other chosen films in your category. Again this year, TUFF is pleased to announce that Film Zones will air TUFF content non-stop during the entire 10 days of the festival, on screens in select downtown stations. As well, the films will be available on our website for viewing. Voting takes place from September 7th through the end festival, so don’t forget to get your friends to vote! Audience votes determine the schedule for the final Saturday of the festival, and the Drake Audience Choice Award. Also, we invite you to join us at our Press Conference on Wednesday Sept 1st at 10:30am, as well as at the TUFF Closing Party and Awards Ceremony on Sunday September 19th, from 6-10 pm. Both are being held at The Drake Hotel in Toronto. Award winning writer-director Deepa Mehta, our guest judge for 2010, will be selecting the top 3 films of the festival as well as the Naish Award for Emerging Filmmakers, and the WIFT-T Award for most ambitious film by a female director. Each guest juror will choose the best in their category, and assist in the selection of films for our other awards. The full list of awards and prizes can be found on our website. This entry was posted on	September 10, 2010 at 9:52 pm	and is filed under Conjuring the not-now, CRUM Projects.